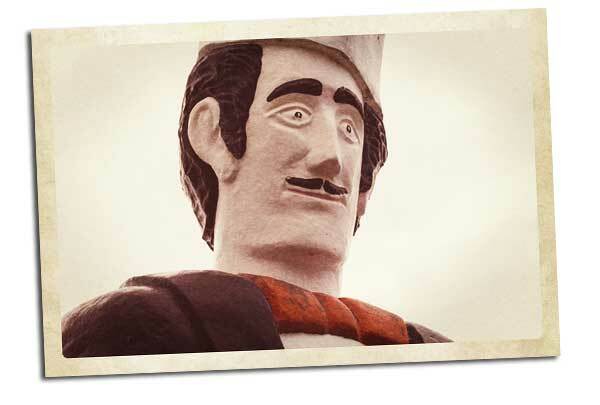 Big Jacques, or as he's known locally, Big Pierre, has a variety of stories associated with him. For some reason I had it in my mind that he was on the Marblehead Penninsula back in the 60s, but that's what memories do, they get confused. Actually, the statue began his career back in the 70s, and it wasn't in Marblehead, but Mansfield, Ohio. A restaurant in Mansfield named Jacque's Restaurant at 118 Lexington Avenue owned by Norman Palsa had the statue built in Indiana, costing about $10,000 to build. In the early 70s, the restaurant closed, Big Jacques remained in place until the business location was purchased by Arthur's Fish and Chips. During the renovation of the old restaurant, Big Jacques was removed which came as a big relieve to many in the community. Although the tray of ham sandwiches is long gone, you can still see the superstructure framework that held the tray in place. In an odd twist, in Mansfield, Big Jacques stood in front of Jacque's Sandwich Shop, which was right next door to the SOHIO gas station. Today, Big Jackque stands in front of an empty lot, right next door to a BP Gas station. In the 1960s, British Patroleum and SOHIO merged and became BP.